The above image is a screenshot of the cancellation and refund rules for a hotel booked through airbnb.com. It mentions "Strict: Free cancellation for 48 hours". 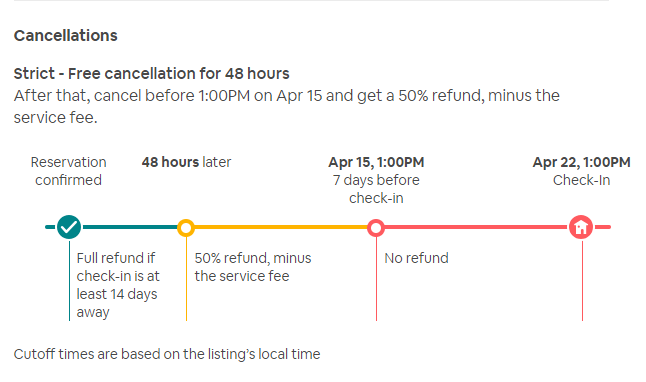 Does that imply that 48 hours after the booking, there will be no refund, or does it mean that 48 hours before the check-in, there will be no refund? It means you can cancel the booking within 48 hours of making it and not be charged, if your checkin date is at least 14 days away. Cancelling 48 hours after booking (but more than 7 days before the checkin date) you’d be charged 50% of the cost (plus the service fee). Cancelling anytime 7 days or less before the checkin date, you’d receive no refund. Not the answer you're looking for? Browse other questions tagged bookings hotels airbnb or ask your own question.